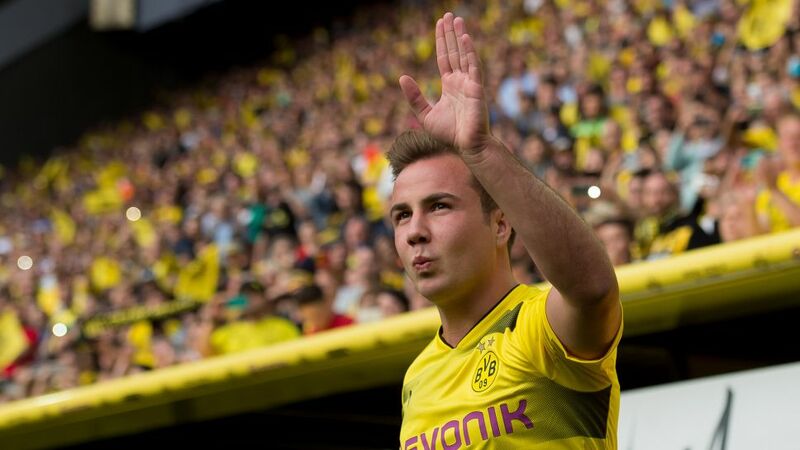 Bundesliga | Borussia Dortmund's Mario Götze: "I'm finally back at 100 per cent"
Borussia Dortmund's Mario Götze: "I'm finally back at 100 per cent"
Franz Beckenbauer once described Mario Götze as "the next Lionel Messi", and three short years ago it looked like the mercurial midfielder would make good on that promise after scoring the winning goal for Germany in the 2014 FIFA World Cup final. When it comes to Dortmund there are two Götzes. There was the Super Mario of 2010-2013, who burst into Jürgen Klopp's first team squad in 2010/11 and dazzled the Bundesliga with his pace and trickery, scoring six goals and providing 15 assists as the Black-and-Yellows claimed their first league title since 2002. He only played 17 games of the following campaign but still provided six goals and five assists as Dortmund made it back-to-back titles, throwing in the DFB Cup for measure. It seemed BVB's Wunderkind could do no wrong and a sensational 2012/13 followed: 16 goals and 20 assists in all competitions for Götze, as Klopp's side were agonisingly beaten by Bayern in the UEFA Champions League final. By then, of course, Götze had already announced his shock move to Bavaria, and as it turned out he would play no part in the Wembley showpiece due to injury. The anger and disappointment of the BVB faithful was in direct proportion to the German international's unique talent, but even the most hard-hearted among them were forced into begrudging celebrations when his sensational left-foot volley sealed Germany's World Cup victory in Brazil the following summer. And then there was Götze 2.0, the prodigal son returning to the Signal Iduna Park in 2016 after an injury-hit final season with Bayern. Unfortunately his body continued to let him down, and a series of niggles restricted him to just 11 Bundesliga games in the first half of the campaign, before a rare metabolic disorder kept him out of action between January and July 2017. Slowly but surely, he has clawed his way back to fitness and has now featured in nine games this term. "I'm finally 100 per cent now," he told Sport Bild this week. "October is going really well for me and I feel really good out on the pitch." Götze is certainly playing with plenty of energy and enthusiasm. Coach Peter Bosz will be pleased to see that the attacking midfielder is covering roughly the same amount of ground in his second stint with Dortmund - just over 11.5 kilometres per game - as he did in the first. However, there remains a sizeable difference between the two when it comes to his impact in the final third of the pitch. In 83 Bundesliga outings for Dortmund before his move to Bayern, Götze had a hand in 56 goals, scoring 22 and laying on another 34. Since returning in the summer of 2016, he has netted just once and provided only three assists, two of them this season against Wolfsburg and Frankfurt. Whilst his confidence is running high, he acknowledges there is still room for improvement. "I knew it would take a long time for me to get back to my best level, and there may still be a couple of kinks to iron out. I think the games in Nicosia and Frankfurt were simply a taste of what's to come. It's true that it's time for me to start scoring goals again - but most importantly, we need to get the team back on track." While Götze seems to have put his injury demons behind him, he is yet to rediscover the swagger and insouciance that defined his successful first spell at BVB. Bosz will be hoping to draw out the natural attacking tendencies of a player who has had just 14 shots on goal in his 17 appearances since last summer, and only makes around 15 sprints per game compared to 21 back in the day. In some ways, given what he has already achieved, it is easy to forget that Götze is still only 25-years old. But in spite of having lifted five Bundesliga titles, four DFB Cups, the FIFA Club World Cup and the World Cup itself, he remains as hungry for success as ever, and is determined to worm his way into Joachim Löw's plans for the 2018 World Cup in Russia next summer. "I still need to do a bit more to return to the national side," he admitted. "But of course I would like to be a part of it. Ultimately the decision will be made by the coach." The next couple of months will therefore be crucial for Götze as he looks to light up the Bundesliga like he did so spectacularly between 2010 and 2013. Fitness will play a huge part, and Bosz will have to be wary of how he employs a player who hasn't strung together five consecutive Bundesliga appearances in 18 months. Promisingly, though, the man who joined BVB as an eight-year-old in 2001 is ready to step up and become one of the squad's leaders. "I realise that I want to take responsibility and I feel capable of doing so," he insisted. "The team gives me confidence." Confidence that he would be only too happy to pay back with another trophy-inspiring season.